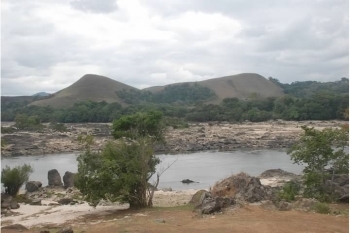 The Ecosystem and Relict Cultural Landscape of Lopé-Okanda has seen over 400.000 years of almost continuous human settlement. Its setting can be characterized by the co-existence of tropical rainforest and savannah ecosystems. The area holds evidence of ironworking and some 1,800 petroglyphs. So, after deferrals in the previous 2 years, Lope finally got inscribed in 2007! As we had visited in 2001 I wish I could help celebrate another addition to my “seen list” by supplying a photo of a Western (or “Lowland”) Gorilla taken in the park. But, despite 2 hard and very hot days of tracking, our efforts were rewarded only by the roar of a male just a few meters away from us in a forest which was so thick that we still couldn’t see him! 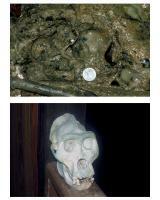 My photos are only of a gorilla hand print in the forest mud and a skull on the veranda of the Mikondo research centre in the Park! In Rwanda and Uganda, trips to see the gorillas are advertised as “Tracking” more as an insurance against the possibility of a failure to see rather than as a true description of the experience. We saw them quite easily in both countries. In Rwanda at least, everything is so well organised with trackers out overnight following each of the families that you would have to be very unlucky not to see the creatures and you do not really “track” them – just go to where the trackers have already made contact. Even in Uganda it is more a matter of following a group which is not trying to evade you from the previous night’s location. And, when you reach them, they are so used to their daily “tourist visit” that they continue their lives totally oblivious of the photo-snapping going on only a few meters away. Indeed you have to wonder whether they are almost too well habituated and give a semi-trained, “over cuddly” view of their existence. In Lope things were very different. The Gorillas there are not well habituated and the tracking skills of the guides are well demonstrated. A path is taken through the thick forest in a likely direction/area in order to look for any signs of the passage of a gorilla – this could consist of some calls in the forest which indicate disturbance/alarm or else something as small as some broken twigs and some trampled vegetation. Somehow the tracker can differentiate a Gorilla sign from that of other forest mammals. When such a sign is found, an estimate is made of direction of travel and how much time has passed – a day, a few hours or less. Depending on this, a circular walk of an appropriate size is made in the forest – if you return to your starting point without finding another sign then the gorilla is (probably!) still inside the circle – if not then a new sign will (hopefully!) have been found at the crossing point and the exercise is repeated. Inside the circle, the tracking might have to be on all fours through whatever terrain is there whilst trying hard not to make a noise when pushing through the undergrowth and spooking the creature into moving ahead of you. In the humid atmosphere it is very hot and hard work! The biting insects have a field day! Despite our efforts to keep quiet, the gorilla we tracked on day 2 knew full well that we were there. On one occasion, we almost made contact but he evaded us and we had to do another circuit. The second time we were too close, he didn’t like it and told us! At that point he decision was made by the primatologist (via radio) to call off the tracking to avoid stressing the creature any further. Our “failure” was a great disappointment – but, in retrospect, the tracking itself was a worthwhile experience and that roar will always be with me. So what else is there to see in Lope? The park is situated at the boundary of forest and savannah (“the park contains the last remnants of grass savannas created in Central Africa during the last Ice Age, 15,000 years ago. These savannahs are now a rare ‘island’ habitat in the rain forests and represent a unique record of biological evolution during that time” - WCS) so there is the possibility of a game drive outside the forest more along east African game park lines. As well as accommodation at the Gorilla Research Centre for the tracking there are other camps in the Park which permit a round trip by 4x4 and boat over several days to see the forest. Both savannah and forest contain some species/races of animals which are different from those in East Africa. For instance Monkeys such as. the wonderfully named “Putty nosed monkey” - which we did see. There are also Forest Elephants – many of the forest paths used during gorilla tracking are in fact made by them but their behaviour is so unpredictable that, the only time we came near to one, our guide changed direction to avoid it! One of the reasons for the 2 year delay in inscription was to sort out a full inventory of the “cultural aspect” of this “mixed” site. This consists of the remains left by early inhabitants of the area going back to the Stone age but mainly of Iron-age hunter gatherers from around 2500-1400BC. The most accessible remains to non-specialists are pictographs etched on boulders close to the banks of the Ogooue River. We reached these in a small boat after shooting a few miles of the Ogooue rapids near Mt Brazza (named after the explorer de Brazza who passed by on his journey to the Congo basin to establish a French presence). The pictographs were not as interesting to us as those we have seen at other Pictograph sites around the world – but we are no experts and this is not to denigrate the significance of the remains overall in developing an understanding of such matters as the migration of peoples in Sub-Saharan Africa. My conclusions about our visit - Lope is an expensive site to reach/visit and an uncomfortable one to travel in. Be aware also that the Gabonese government makes getting tourist visas very difficult and that Air Gabon was unbelievably unreliable. You might get lucky and see gorillas but, far more likely not! The site may well be very significant both in natural and cultural terms but does not yield its “riches” easily to the passing tourist or even one who stays several days. However, if you approach it in full knowledge of this, then it does provide some rewards. Middle Pleistocene: 400,000 years of almost continuous history (AB ev) - early stone age sites; the petroglyphs date from between 2,300 and 1,400 BP. Recently discovered: Excavations started at 1987.